Looking for a unique space for your corporate relocation? 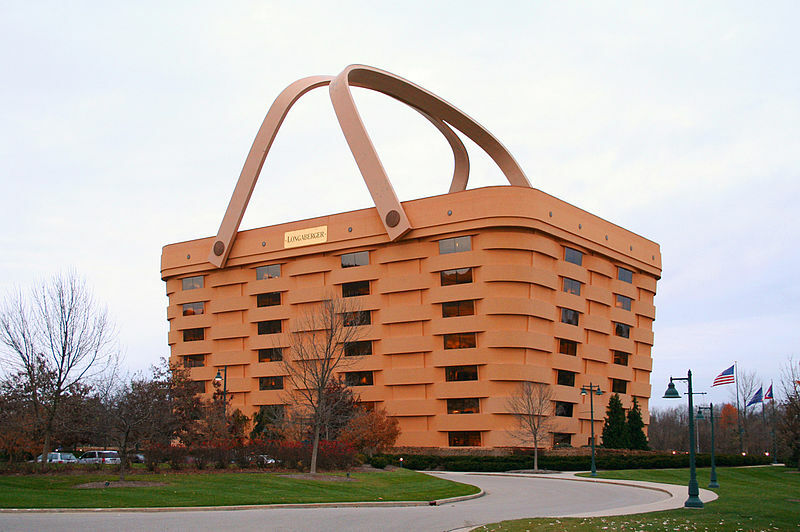 This basket-shaped Ohio building may be the perfect fit. Ideal for picnic and weaving fans alike, this eccentric structure was originally built in 1997 for the Newark, Ohio-based Longaberger Company, a creator of—you guessed it—high quality handcrafted baskets. But now the company is financially faltering and looking to offset its giant, basket-shaped asset, on which it owes over $570,000 in back taxes. The seven-story, 180,000 square foot building was custom designed by the company, and the handles alone weigh nearly 150 tons--roughly the same weight as 50 elephants. To avoid ice damage, these humongo handles are heated in the winter. A tisket, a tasket, a 180,000 square foot basket— if you need a big, bold space in Ohio, this creative design might be the right move for you.